Me and my wife occasionally play a simple game when on longer car journeys. In the UK the last 3 characters in a car registration plate are letters. The aim of the game is to come up with words which start with the first letter, end with the last letter and contain the middle letter. So for the example plate in the image above we’d use SMR, a word that we could choose would be ‘speedometer (since it starts with s, ends with r and contains m’). Computers, unsurprisingly, are very good at this. Here’s an example of a super simple python script which prints matching words (this assumes you are on a Linux system, or at least a system with /usr/share/dict/words. 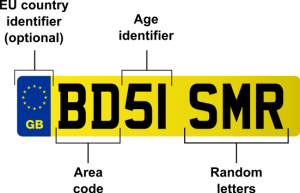 print "Please provide a reg plate"